Valerie Naranjo, (NBC SNL Band for 22 years, Lion King on Broadway for 21 years) is the only Westerner to receive a first prize at Ghana’s Kobine Festival of Traditional Arts. “Knock on Wood – the film” documents this activity and has appeared from Woodstock to Katmandu. Valerie traveled to Ghana 21 times, and to nine other African countries; and has appeared with The Philip Glass Ensemble, The Paul Winter Consort, Carole King, Zakir Hussein, Airto Moreira, Glen Velez and others. Drum! 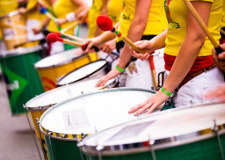 Reader’s poll named her “World Music Percussionist of the Year”, and Mallet Percussionist of the Year” 3 times. She compiled with mentor Kakraba Lobi several CDs, “West African Music for the Marimba Soloist”, and Joro(5 concerti for gyil and orchestra), teaches West African Percussion and Dance at New York University’s Steinhardt School and performed, in 2017, in India and Cuba with NYU’s Global Institute for Advanced Studies. 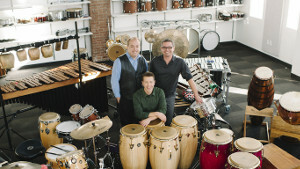 Africa→West Percussion Trio; whose members include Jamie Ryan, Ryan Korb, and Josh Ryan, is dedicated to the performance of African and Afro-Caribbean styles of music in addition to Western percussion music. Their unique compositions and arrangements of folkloric styles are influenced by the members’ studies abroad and with master musicians in African and Afro-Cuban genres as well as their backgrounds as classical and jazz musicians. The concept of “Africa→West” demonstrates not only the trio’s interest in folkloric music, but also how African and Caribbean music has been shaped by the experiences of Africans in the Western Hemisphere. Combing the aesthetics of contemporary chamber music, jazz, and folkloric drumming ensembles, Africa→West performs in concert halls, at jazz festivals, and in world music venues. The group regularly performs at Baldwin Wallace University, where it is an ensemble-in-residence.